I currently have two teenage daughters. Let me give it to you straight – this is not a road for the timid to travel!! I would love to write this post from a place of strength, to be able to say I’ve mastered this phase, got this parenting-teens thing down. But the reality is that I fail at this stage of motherhood almost every single day. I only write this from a place of sharing what I’m figuring out. It’s a list of things that seem to work if I can only remember to be consistent in implementing them. Here are seven ways I try to help my teenage daughters. 1. Allow her to fail. Let’s just start out with a hard one here. We inherently want our child to succeed, but sometimes lifelong lessons are learned when she fails. I’m not advocating sending her into a dangerous or morally questionable situation. Rather it’s about allowing her to deal with the consequences of decisions she makes on a regular basis. For example, one of our daughters recently wanted to spend some money on a certain activity. We didn’t think that was a wise choice. But instead of telling her she couldn’t do it, we allowed her to make the decision herself. She followed through, and from a couple of remarks she’s made, I think she’s already learned an important financial lesson. This will stick with her much more than if we had just given her a lecture and told her not to use her money in that way. 2. Give her your full attention while she’s talking. Teenagers are old enough to know if you’re really listening to them or not. They will quit trying to communicate with you if you’re not willing to focus on them when they’re speaking. 3. Laugh together. Find the funny in things that happen and share them with your daughter. Also, when there’s tension between you, pulling out your sense of humor can lighten the mood more quickly than almost anything else. 4. Praise her for good character traits and positive actions. While it’s okay to compliment her on how nice she looks or how cute her new hairstyle is, make sure to notice and comment on how responsible she is in taking care of her siblings, how she was diligent and got that class project done on time, how she willingly helped the neighbor take her groceries into the house. 5. Teach her to do her own laundry. This is about more than laundry, though. Delegate certain household responsibilities to her, demonstrate how they’re done, then make it her job to complete them on a regular basis. 6. Help her value relationships above material possessions. Let her see that people and their souls are what will last forever, and how you treat others is important whether it’s friends, family members, classmates, or just a stranger. 7. Pray for her. She so needs your prayers for her health, friendships, school work, daily decisions, her walk with God. Since my girls first began school, I have prayed almost daily for them to make good decisions and wise choices. While there will still be some rough days ahead, what a wonderful relationship we can have with our teenage girls as we help them navigate this special season of their lives! 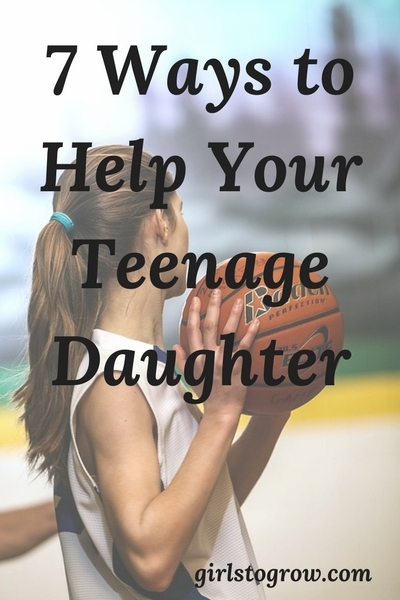 In what other ways can we help our teenage daughters? I'm not sure these are just for teenagers! I know that I work on them with all of my children. 🙂 Especially the listening. Ugh! But I know that I need to listen to them now so they will talk to me — really talk to me — when they're older. Yes, I think these would apply to all children, no matter their age! All good ideas. Allowing them to fail is hard but also so very necessary.